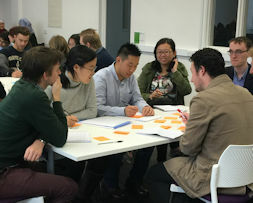 Facilitation is an extremely useful skill for all researchers , to help manage meetings and working with others, particularly if you work in teams, work with people as part of your research or have opportunities in public engagement. It is also an important leadership skill and an extremely useful skill to demonstrate for your future career. The LDC Development Team is offering a new series of short workshops in September to help attendees gain and practise skills in facilitation. The series begins with a webinar to help you learn more about facilitation, followed by a workshop, which expands on the techniques of facilitation and provides practice to learn and practise these techniques. The series concludes with two workshops that focus on designing and facilitating your own teaching session using an experiential learning model. Note: These events are designed as a series and attendance at each event is strongly recommended before attending the later workshops in this series.